Ngarara Place is a significant addition to the cultural and campus life of RMIT University. 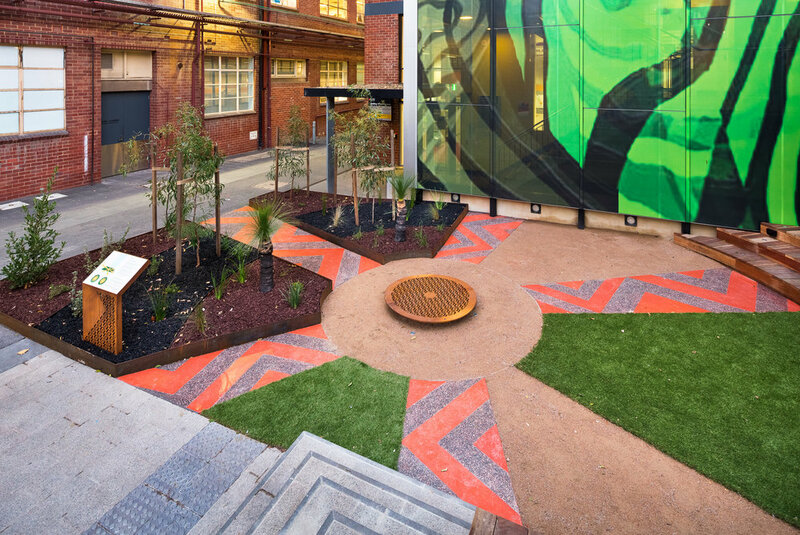 In recognition of the oldest continuing culture in the world, a newly conceived landscape/urban design intervention has been incorporated adjacent to the key cross access (of Chemistry Lane) within the heart of RMIT’s city campus. This project stemmed from the University’s Indigenous Unit – the Ngarara Willim Centre to build a visible presence and recognition of Aboriginal and Torres Strait Islander peoples, cultures and histories as connected among the lands of the Kulin Nation in which RMIT stands, with particular deference to the cultural continuity of the custodians of the land especially the Wurundjeri and the Boon Wurrung. The project draws on four key pillars, which anchor the design narrative embedded in the scheme. The initial starting point was to reinforce the importance of Aboriginal people’s connection to Country. This notion was woven through as exploration of the six/seven seasons of the Kulin Nation. Consequently this aspect saw the division of the design into seven sections, being six on the ground plane and one in the vertical dimension (to an adjacent glazed façade). The demarcation of the ground plane enabled distinct zones for tiered planting, an area for traditional dance/ceremonial practice, amphitheatre seating and a primary focal point being a sculptural laser-cut smoke pit. The second pivotal element included a number of radiating arms which reach out to adjacent buildings through a broader urban design gesture. Critically these design features infuse cultural motifs which pick up on Indigenous cultural and artistic practices specific to the South East of Australia, namely traditional carving practices (references to Dendroglyphs – carved trees) as well as body paint, through an etched paving graphic which doubles as the primary access points in the courtyard space. The most visible gesture, signifies the power of art in the public realm, acting as a striking marker in the landscape, being an unashamedly contemporary and specifically curated piece of artwork by Aboriginal digital artist Aroha Groves. The piece evokes nature, place and connections to Country and acts as a backdrop that reinforces the landscape setting in which it is located. The space importantly acts as a place of pause or contemplation, within the hustle and bustle of a busy University counteracted by an intimately scaled landscape setting. 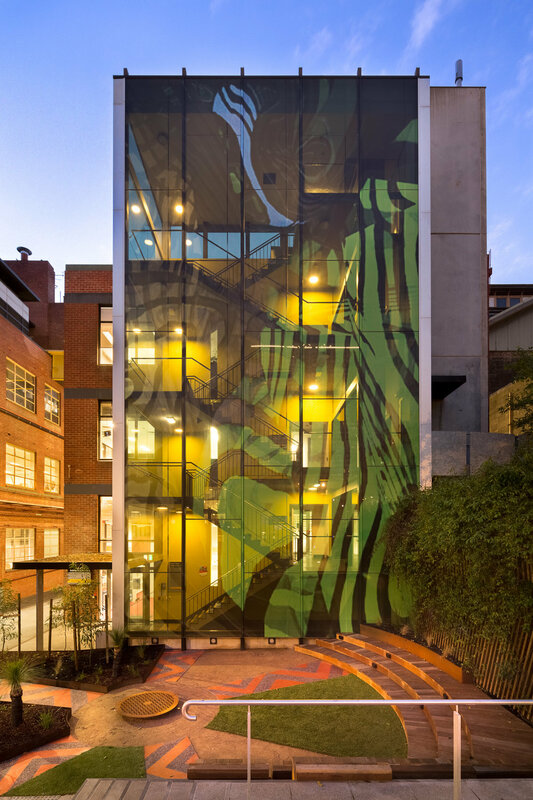 Here the existing staircase connected to the adjacent Alumni Courtyard (within the Old Melbourne Gaol precinct) provided an opportunity to amplify a sense of enclosure through the completion of an amphitheatre, using local blackbutt timbers overlooking the green space. All planting used are endemic and Indigenous species to the local incorporate planting to communicate the importance of landscape in sustaining life and cultural practice, including specimens traditionally use for edible, medicinal and practical purposes (i.e. for weaving). Pedagogical panels engage the public by providing a cultural context of interpretation as a means for cultural exchange. The landscape reinforces and reveals layers of history and meaning through an active gesture of reconciliation, while infusing Indigenous sensibilities within the heart of the City of Melbourne and begins to broader the frame of reference in which people can connect to place.